Get ready to say goodbye to the old and hello to the new! 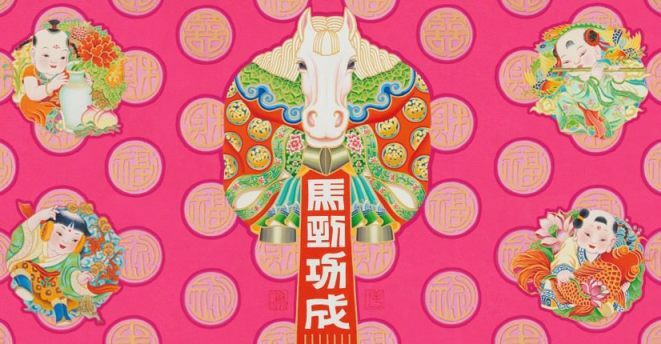 Join in the festivities of Sydney's Chinese New Year Festival and celebrate the Year of the Horse with a slew of activities in from Friday 24 January to Sunday 9 February 2014. There are over 80 family friendly events celebrating the cultures of China, Korea, Vietnam, among others, Sydney's Chinese New Year Festival is a much-loved spectacular celebration on Sydney's cultural calendar, with a kaleidoscope of food, art, performances, workshops, tours and heaps more on offer for people of all ages. You will find the full program on the official Sydney Chinese New Year Festival website where you'll also find detailed information about the events as well as information for visitors. The following pages highlight some of the main events in 2014's Festival, most of which are free and family friendly. So read on, save the dates and see you there! Featuring Asian Australian artists, Crossing Boundaries is a captivating exhibition which examines the strength and variety of relationships and artistic exchange between Australia and Asia. Expect to be blown away by the paintings, sculptures, photographs, installations and ceramics on display. Artists showcased in this exhibition have shared their personal journey whether it'd be about discovering new territories or crossing boundaries. Bring your children along because there will be a program especially designed for children with works on display by William Yang and Pamela See. What's more, there will be exciting daily floor talks in addition to artist forums. Quit horsing around and get to the Festival Launch at Belmore Park to celebrate the beginning of Chinese New Year on Friday 24 January. Step into an extraordinary world of delicious food and flavours from a huge selection of cooking stalls while enjoying the effervescent atmosphere of Sydney's favourite event. Allow the firecrackers to drive away the evil and celebrate the New Year. An exciting entertainment line-up has been organised for this evening with break dancing, drumming, contemporary soundscape, lion dancing, pop and traditional music as well as special performances guaranteed to take your breath away. What's more, the PopAsia crew will have you dancing like a villain with all the hottest hits from Asia. The Twilight Parade will definitely be a splendid sight so don't miss this event on Sunday 2 February. The Parade will begin from Sydney Town Hall and make its way to Harbour Street from 8pm. Don't forget to look up at the city buildings as gorgeous projections appear. There will be all sorts of things for you to see including a magnificent carousel lit up ready to dazzle you, rocking horses which will bring back fond memories of childhood, and heaps of jockeys on bikes. All kinds of floats will appear from the local Chinese, Korean and Vietnamese communities so expect hip hop, martial arts, singing and lots more. Anticipate fantastic entertainment, awesome surprises and splendid sights which will make this night a memorable one. Experience the excitement, witness the spirit and feel the power of the dragon as the 12-metre dragon boats make their way to the finish line at Cockle Bay. With a dragon's head carved at the bow in detail, a painted dragon scale hull, an ornate tail at the stern, and a team paddling their hardest, it will certainly feel as though these dragons have come alive in the bay. Cheer as the boats compete and get a real taste of something that is an integral part of Chinese culture symbolising patriotism and group integrity. Frock up, put on your dancing shoes and head to the roaring Dragon Ball for an extraordinary night of cocktails, dancing and partying. Don't miss out on this popular event at The Star Event Centre. From its early years in the Trocadero, the Dragon Ball has gotten bigger and better every year and has become the event on the Chinese social calendar. So get ready to party with the people, tear up the dance floor to the sounds of the fabulous Dragon Ball Band, and party until midnight with delicious cocktails in hand. Since 1848, Sydney's had a significant Chinese presence, but do you know the story of Sydney's Chinese? It's time to buckle up your helmet, hop on a bike and follow your professional bike guide on a tour of Our Chinese Past. You'll begin where Sydney's original Chinatown used to be, The Rocks, and then cycling to where Sydney's second Chinatown was in Haymarket on Campbell Street before ending up in the present Chinatown on Dixon Street. There will be informative talks at each location which you'll find fascinating and interesting. The tour finishes with some traditional tea and dim sum at the stunning Chinese Garden, where you can immerse yourself in the beautiful surrounding, relax and forget about all your troubles. What a perfect way to end the tour! Why? Because it's time to welcome the new year! When: Various times & days have been listed in the article.